Powers/Abilities: Arlo Samuelson briefly had the ability to levitate himself and others via a build-up of chemical energy within his body. His levitation abilities were sufficient enough to lift large amounts of gold bars, alter the trajectory of bullets, and even force a helicopter to the ground. His powers increased as the chemical energy in his body increased, but his powers could be stopped if he were to contact anything that was touching the ground. The act of touching a grounded object released the energy in his body in an explosion of energy feedback. History: (Marvel Super-Heroes III#11/2) - After Arlo Samuelson's theories of levitation were ignored by Dr. Bill Foster, Arlo followed him home from work and asked him to look at a manuscript of his theory. Bill claimed that Arlo's theories were "looney tunes," but agreed to take a copy of the manuscript if it would get Arlo to go away. Arlo then returned home to find his girlfriend Donna angry at him for not having a job. When she threw a can at him, Arlo became determined to earn people's respect and decided to test his theories on himself in order to gain some attention and respect. Due to his lack of funds, Arlo had to substitute a few chemicals in his formula and when he did, the fumes from the substitutions overwhelmed him and he passed out. When he awoke, he was levitating above the floor. He tried to steady himself on a table, but found that when he touched anything that was grounded, he experienced severe energy feedback due to the substitutions he had used in his test. He soon focused on how he would be able to reach his manuscripts and find a cure for his condition, and found that when he focused on an object, he could levitate it as well as himself. Grabbing up his books, Arlo escaped his lab just as the police arrived, responding to a noise complaint. Shortly after, Arlo stopped by a local hotel and asked for a room. When the cat at the counter jumped on him, Arlo realized that only inanimate objects caused the energy feedback he had experienced earlier. Arlo then realized that if only inanimate objects caused the feedback, then there must be a chance for a cure. He then figured that he needed some gold to act as a conductor in an experiment to create a cure. Thinking that he might be able to get help in obtaining the gold, he visited the home of Doctor Algus, who threw him out, thinking him a fraud and that he was using cheap magician's tricks to appear to be levitating. The next morning, Arlo had made a reputation by stealing the gold that he needed to cure himself. With a new reputation, Arlo began to go mad with power, downing a police helicopter and sending bullets fired at him in other directions. 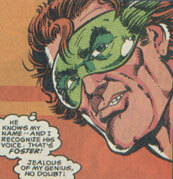 Following his scuffle with the police, Arlo attempted to rob a jewelry store of its gold, coming face-to-face with Bill Foster in his Giant-Man identity. In order to stop Samuelson, Giant-Man followed him across town trying to explain that Arlo had made an error in his calculations. Eventually catching him, Giant-Man touched Arlo to the ground, causing massive energy feedback. When the feedback explosion had subsided, Giant-Man explained to Arlo that he had overlooked the principle of capacitance and that the levitational energy building up inside of Arlo had been slowly driving him insane. Giant-Man then explained that by touching Arlo to the ground, he had shorted out the building levitational energy and that he would explain to the authorities that Arlo was not responsible for the damage he had caused. Just as Giant-Man offered a job to Arlo at Stark Enterprises, Donna rushed up and apologized to Arlo for throwing him out. The two made up and Giant-Man realized he had forgotten his lunch date. Comments: Created by Dwayne McDuffie, Jim Shooter, Bob Budiansky, Don Hudson, Manny Manos, and Chris Ivy. 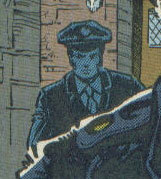 Arlo lived in the same city where Giant-Man worked for Stark Enterprises. Given that Stark Enterprises was based in Los Angeles, California, it seemed logical to have Arlo's base of operations in Los Angeles, despite the story never revealing where it taking place. Doctor Algus was another scientist that Arlo had approached with his theories of levitation. When Arlo realized that he needed gold to cure his powers, he visited Doctor Algus, who called him a fraud and ordered him to leave. Donna was Arlo's girlfriend, who had grown tired of him not having a job. When he returned from giving his manuscript to Bill Foster, Donna threw him out of her apartment. The next day, when she saw Arlo on the news battling Giant-Man, she rushed to the scene of the battle, where Arlo's powers had shorted out. He happily explained to her that he now had a job at Stark Enterprises and the two made up. Felix was a cat belonging to the manager of the hotel that Arlo visited the night of his transformation. When Felix jumped on him, Arlo realized that only inanimate objects caused the energy feedback that came with his powers. Murray was a police officer who responded to a noise complaint coming from Arlo Samuelson's lab. When he and another police officer arrived on the scene, Arlo had escaped and Murray deduced that the noise complaint was just a crank call.